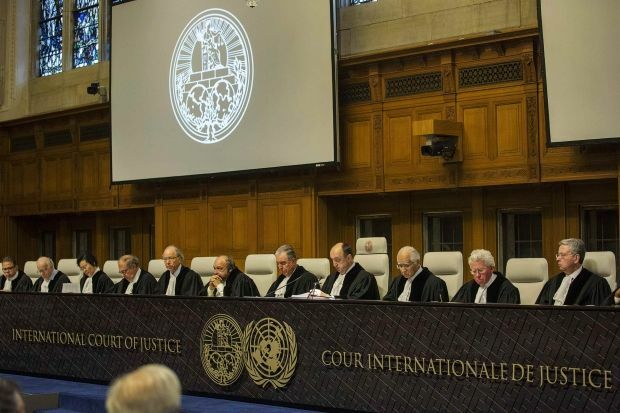 Ukraine has lodged a lawsuit with the International Court of Justice in The Hague in order to make the Russian Federation liable for acts of terrorism and discrimination amid its illegal aggression against Ukraine, according to the Ukrainian Foreign Ministry's press service. "The case has been filed under the International Convention for the Suppression of the Financing of Terrorism and the International Convention on the Elimination of All Forms of Racial Discrimination," it said. Ukraine states that the Russian Federation has been violating the Terrorist Financing Convention by supplying weapons and other forms of assistance to illegal armed groups in Ukrainian territory. "These groups have committed acts of terrorism in Ukraine with weapons supplied by Russia, including the downing of Malaysia Airlines Flight MH17," it said. Read alsoNames of people responsible for MH17 downing to be known by 2018 – media"Other acts of terrorism include the bombardment of residential areas in Mariupol and Kramatorsk, the destruction of a civilian passenger bus near Volnovakha, and the deadly bombing of a peaceful gathering in Kharkiv," it added. Further, Ukraine claims the Russian Federation has been violating the International Convention on the Elimination of All Forms of Racial Discrimination by engaging in a campaign of discrimination against non-Russian communities residing in the occupied Crimean peninsula, namely ethnic Ukrainian and Crimean Tatar communities. Read alsoUN General Assembly votes for resolution on human rights in Crimea"Starting from the illegal 'referendum' held in an atmosphere of intimidation, the Russian occupying authorities have implemented a cultural cleansing policy against these communities. This pattern of discrimination has been condemned by the UN General Assembly and includes a ban on the work of the Mejlis, a representative organization of the Crimean Tatar people; a wave of disappearances, murders, and arbitrary searches and detentions; attempts to silence the media; and restrictions on the teaching of the Ukrainian and Tatar languages," the ministry said. "As part of its unlawful aggression in Ukraine, the Russian Federation has displayed contempt for the basic human rights of the people of Ukraine," said Pavlo Klimkin, the Minister of Foreign Affairs of Ukraine. "We have tried to resolve the disputes through negotiations as required by the Conventions for more than two years, but the Russian Federation has been unwilling to cease its violations of international law. Therefore, we have filed our case to hold the Russian Federation accountable for these violations and to vindicate the fundamental rights of the Ukrainian people under these treaties, to which the Russian Federation is a signatory." Ukraine also requested the International Court of Justice to impose provisional measures to prevent Russia from compounding its human rights abuses while the case is pending.